ROME --- Leonardo announced today that the Portuguese Ministry of Defence (MoD) has selected the AW119Kx as its new multirole single engine helicopter to meet its future operational requirements. The Portuguese Air Force is set to take delivery of five aircraft with an option for a further two units. Deliveries are to start in late 2018 from Leonardo’s plant in Philadelphia (Pennsylvania, USA), with completion of deliveries by early 2020. The contract awarded by the Portuguese MoD is valued in excess of €20 million. 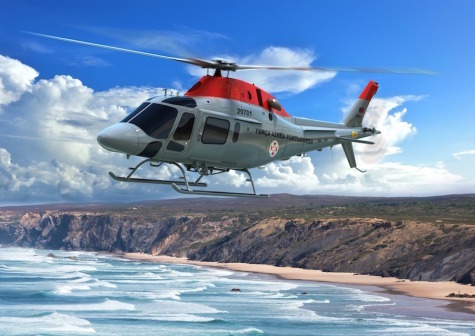 The AW119Kx helicopters will be used to perform a wide range of roles including training, MEDEVAC, troop transport and short-range maritime search and rescue (SAR) and may be used for firefighting. The AW119Kx was selected following a thorough and rigorous assessment of competing models, demonstrating that Leonardo’s solution was the best suited to meet the stringent requirements of the customer. This selection marks a further reinforcement of the long-standing partnership between Leonardo and the Portuguese Ministry of Defence in the helicopter sector following the supply to the Air Force of AW101s for long range SAR, utility, personnel recovery and fishery protection missions and of Super Lynx aircraft (including a Mid Life Upgrade) to the Portuguese Navy for maritime duties. The AW119Kx will provide greater versatility and performance compared to the current Portuguese Air Force fleet of ageing single engine rotary wing aircraft, as well as an outstanding training capability for military crews before moving to the AW101, Super Lynx and other frontline types. The AW119Kx is a best in class single engine helicopter featuring an advanced avionics system for enhanced situational awareness, mission effectiveness and safety. The AW119Kx is provided with the largest cabin in its category, able to accommodate up to six passengers, and redundancy of all critical systems, typically available on multi-engine aircraft, ensuring outstanding safety and reliability. Almost 320 AW119 helicopters have been ordered to date by nearly 130 customers in 40 countries. The new AW119Kx is perfectly suited to perform many roles including government/military duties, utility, EMS, firefighting, law enforcement, training, VIP/corporate transport and offshore transport.